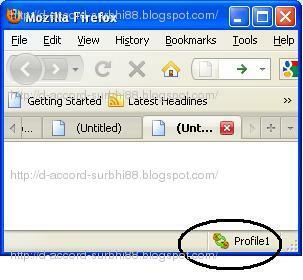 Its Easy now to open Multiple orkut Accounts without doing logout to one account and then sign in to another. 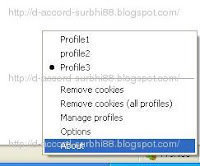 By using Mozilla Firefox with ads on CookieSwap, its possible to use many of your orkut or gmail accounts just with one click. When swapping profiles with CookieSwap, the cookies in all tabs and all browser windows are changed at the same time. This means that your web login to sites like gmail will change in all the tabs at once. 2. After installing the cookieSwap you will find Sign of CookieSwap With Profile name om the very right Bottom of the Browser as shown in the Picture. here Profile1 Comes as default. 3. Now login with your first orkut account.... and by this your username and password will be saved as cookie in the profile1. 4. Now click on the Sign of cookieSwap, a menu will open with many profiles.... as shown in picture.... choose any other profile and now login with your second account.